Held every year in the month of November, Pushkar fair is the ideal occasion to witness the charisma of Rajasthan in full bloom. Every ingredient that makes Rajasthan a distinct place can be spotted in the fair including men dressed in colorful traditional clothes, women in mirrored skirts and vivid shawls, embroidered clothes, exquisitely designed jewelry, pots and ornaments. This four day long fair full of fun and frolic falls on the full moon of Kartik Purnima and offers an unique opportunity for a shopping spree while giving an edge to the consumer product marketing in rural Rajasthan. Improved accommodation facilities have made it an International event A large camel fair in which traders from all over Rajasthan participate to parade, race and trade their camels, horses and cattle give it a fascinating touch. The acrobats, jugglers, snake charmers and fire-eaters will leave you mesmerized with their skilled performances. Cruise on a camel safari and get the real flavor of the fair. Pushkar is small town very near to Ajmer. It is famous for some of the unique tourist attractions of the region. Pushkar is famous for holy sarovar, temple of lord Brahma and shopping of handicraft items. But apart from all these pushkar is famous for would renown Pushkar fair whish is held every year in the month of November. This is the time which is most recommended to visit pushkar. If you travel & take partduring 4 day long fair. 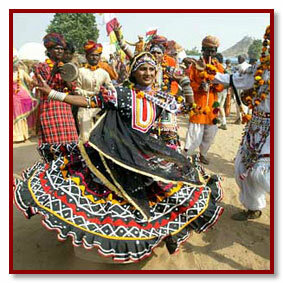 You will experience different India and get to know the traditional life of the rural rajasthan. During this festivals many cultural event held every day. Pushkar camel safari is one of them. So come & enjoy this magnificiant moment.